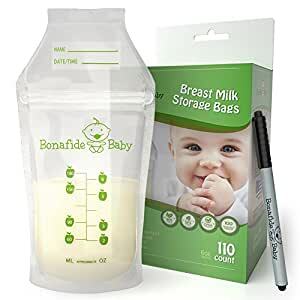 NEW IMPROVED BREAST MILK STORAGE BAGS FROM BONAFIDE BABY. More bags than the standard 50 and 100 count alternatives along with a free non-toxic marker for easier freshness tracking we've delivered on value while not sacrificing on quality and safety. DEVELOPED BY A MOM FOR MOMS! We know you want quality value and of course the safest products for your baby. That's why our bags were developed by a mom for moms. We also listened to all our customers who requested more ease-of-use for the perforated tear off top - you asked we delivered! Each bag has upgraded freezer safe assurance with improved double seals to prevent leaks. Remember our bags are BPA BPS free CPSIA compliant latex free and pre-sterilized for your little one's safety. And unlike some major brands every bag contains a removable safety seal for your peace of mind. SATISFACTION GUARANTEED OR YOUR MONEY BACK! All of our products are backed by a 100 money back satisfaction guarantee. If for any reason you aren't satisfied simply contact us for a full refund your purchase price period! CLICK THE ADD TO CART BUTTON NOW AND ORDER WITH NO RISK!! Very thick bags compared to other brands; definitely don't have to worry about bags leaking. But the bags seem to not lay flat and freeze as well as Lasinoh bags; take up more space in freezer. Update 7/22/17: just using up the last few bags in the box today. I was about to pour milk into a bag and noticed some metal flecks/flakes inside. Threw that bag out and then examined the last bag -- same thing. This worries me because the flecks/flakes are so small and I am worried that I didn't check previous bags carefully! Now I will have to examine each bag before I feed to my baby. I don't understand how the flakes got in there since they are sealed -- must have happened during the sealing process at manufacture. Won't be buying these again. 5.0 out of 5 starsSave that Liquid Gold! Love these storage bags. After three months of trying to breastfeed and MANY frustrating nursing attempts, we decided pumping and bottle feeding was the best choice for us. 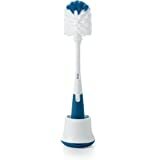 I started out using lansinoh brand, switched to up & up brand by target, switched to medela and then I found this brand. Every single brand that I have tried have all leaked. 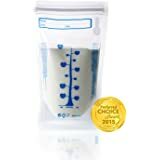 All of you pumping or breast-feeding mamas know how frustrating it is to lose a single drop of liquid gold, especially if you have low supply. These bags don't leak a single drop! I have also noticed that on the other brands that The ounce lines are not accurate. While the ounce markers on these ones aren't 100% accurate, they are the most accurate Out of all the other brands. They are very durable and well made. The marker that comes with it is nice as well. I was using sharpie before and I didn't even think of the fact that it could contain toxic chemicals. The tip is fine and it makes the writing very easy to read. They store very nicely and they stand up on their own as well. There is not a place for the total amount of milk that you pumped, but I just write it on the date line. I don't usually write my name so I write the date and time on the "name" line. It's also a fantastic price for 110 count. Will definitely stick with these bags from now on. After having a couple other brands of bags leak after freezing, I decided it was time to invest in higher quality bags. I tried two other brands before finally finding these. The quality is fantastic. They are thick, sturdy, easy to open and pour, and they seal tight when closed and stand up well. They can freeze fairly flat too. Best part... I just finished most my first box with no leaks! The measurement is accurate when the bottom of the bag is fully flat and I push the sides in at the zipper to make the bag opening more rounded. The marker is handy and I have plenty of room to write the 4 things I need on the label; name, amount, date, and time. I love that these are made in the USA too. UPDATE I've been through 4 boxes of these and not 1 bag has ever leaked. 5.0 out of 5 starsLove these bags! My first baby was exclusively breastfed and when I did pump and store I tried multiple brands, Medela, lansinoh and nuby to name a few. They were all awful in my opinion. I had issues with leaking and spilling when trying to pour milk in a hurry. 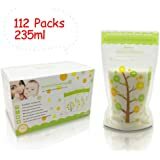 I found honeysuckle bags and absolutely loved them, no leaking, sturdy, no spills... I thought I'd found the holy grail. When I got pregnant with my second I knew I'd need to buy more! But.. they're discontinued apparently on Amazon so I began to look elsewhere. I found these and read some reviews and decided to give them a try. I LOVE them. They are just as good if not better than honeysuckle brand. Super sturdy, no issues whatsoever with leaking and store nicely. I tend to lay them down so they stack nicely in the freezer. 100% recommend, definitely the best and most affordable brand I've tried! I have to give these bags a high review! The seal on the bags is phenomenal! I never, ever have to worry about milk leaking with these. The only reason I didn't give it 5 stars is because the product is not always available to be sold. Twice I found myself in a painic. The first time it wasn't available I thought no big deal, I'll use another brand. I purchased the Lansinoh bags... big mistake. 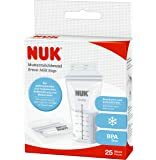 After the first use my MIL complained of leakage. Luckily I went back to the site and it was available again. The second time, I was seriously down to almost 5 bags while stalking Amazon for product availability. I even chatted with the company via FB and they responded quickly to say the bags would be back in stock very soon.... and they were. I will say I've noticed enhancements with the product over the year I've been using it. A better writing marker that doesn't bleed and an easier perforation line. 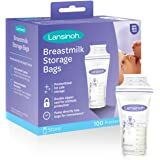 Overall, I love the product and would recommend to any breastfeeding mom that pumps. I would also suggest buying two boxes if your budget will allow.